This page is dedicated to the memory of the animals who faithfully served in Normandy during the Second World War. ‘Blackout’ served with the United States Coast Guard. He earned three battle stars on his service ribbon; Sicily and Italy in 1943 and then Normandy in 1944. His fellow crew members even provided him with a specially made life jacket. 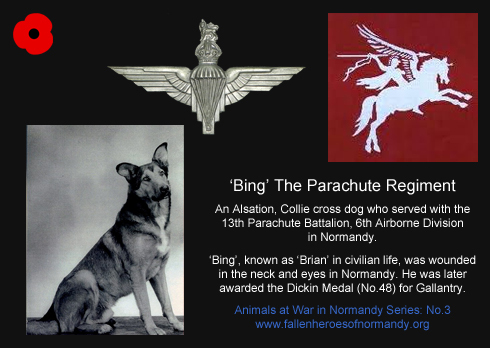 Known as ‘Brian’ in civilian life, ‘Bing’ was his name while he served with the The Parachute Regiment. 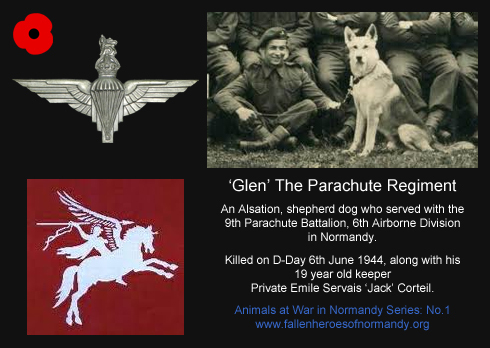 He was an Alsation, Collie cross who served with the 13th Parachute Battalion, 6th Airborne Division and landed on D-Day near Ranville, Normandy, France. ‘Knobby’ served with the United States Coastguard. 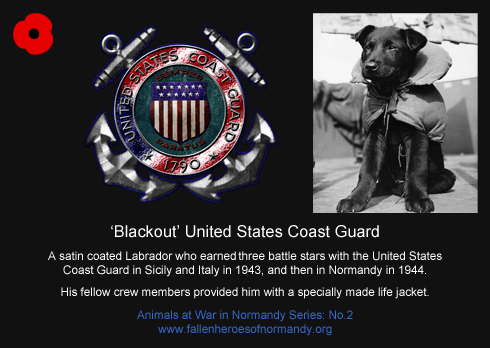 He was a Mongrel pup and mascot on a United States Coast Guard Rescue Cutter. 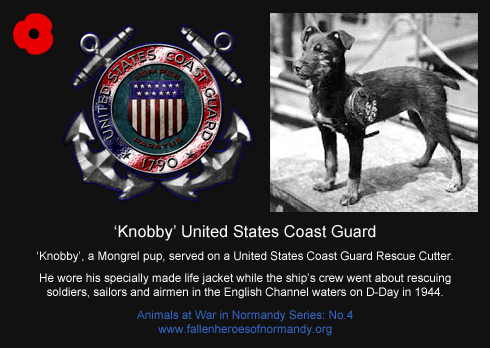 On D-Day, and throughout the Normandy campaign, ‘Knobby’ wore his specially made life jacket while the ship’s crew went about rescuing soldiers, sailors and airmen in the English Channel waters. 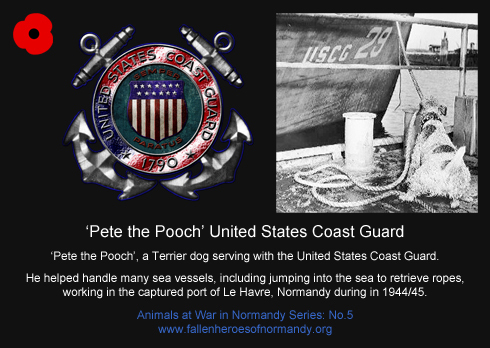 ‘Pete the Pooch, Able Seaman’ served with the United States Coast Guard. He helped handle many vessels, including the 83 foot cuter he is helping tie up in the photograph, and would jump into the sea to retrieve ropes. ‘Pete the Pooch’ worked in the captured port of Le Havre in Normandy during 1944/45. 17th December 2013. Spiegel Online International. Britain’s Luftwoofe: The Heroic Paradogs of World War II. 26th June 2013. Mail Online. D-Day, the first tweet! Medal given to homing pigeon who was first to deliver news of successful landings set to be sold at auction. 26th June 2013. Paul Fraser Collectables News. Pigeon’s ‘Duke of Normandy’ WWII Dickin Medal valued at $15,500 with Bosleys. 4th December 2012. onty relaxing with Rommel (his pet dog) and laughing at George Formby: WWII snaps show hero of El Alamein on and off-duty. 2nd November 2012. The Telegraph. Quest to crack secrets of lost D-Day pigeon. 18th April 2012. Mail Online. Bing, the dog of war who parachuted into France to become a D-Day hero. 24th Sept 2010. BBC News. Wartime hero pigeon ‘Paddy’ honoured with fly-past. August 2007. America in WWII. Pigeons of War. I found your site by accident while looking up my grandfather’s details. I wish I had a photo of him I could send, but I found out more about him from your website than I have known in my life. Thank you for acknowledging animals caught up in wars. They are the forgotten heroes, regardless of which ‘side’ they were with. Your tribute page to these beautiful creatures is rewarding, and I look forward to reading more posts. Thank you.